More people die in economic expansions, and fewer die in recessions. Whether and how policy makers should heed this pattern depends on the hitherto unknown links between mortality and economic activity. Recessions can be stressful and depressing, especially for the people who lose their jobs. Suicide rates spike during recessions, and for that reason alone recessions have been called deadly. Two researchers, David Stuckler and Sanjay Basu, noted that suicides and binge drinking are positively correlated with unemployment and concluded that “Austerity kills” by adding to unemployment. Even if we could be sure that austerity and related fiscal policies create recessions, it would be premature to conclude that they literally kill people. Industrial and construction accidents are more common in economic expansions, and less common in recessions because those industries’ activities follow the business cycle. Overtime hours may be more dangerous than average, and overtime is more common at the peak of the business cycle. Moreover, the share of people working in construction – one of the most hazardous industries – increases during expansions and falls during recessions. With more accidents at work and on the road during expansions, expansions have more deaths by such accidents, and recessions have fewer. It turns out that the business cycle for suicides is more than offset by the business cycle for other deaths. Mortality and the unemployment rate are negatively correlated. Christopher J. Ruhm, a professor of public policy and economics at the University of Virginia, has looked at all causes of death and found that most of them – suicide was the exception – occur less frequently at the depths of the business cycle. Perhaps most surprising is that the business cycle for overall deaths is dominated by the business cycle for deaths among elderly people, perhaps especially elderly women. Because so many elderly people are retired, they are especially unlikely to have recently been laid off from their job (which can lead to suicide), to drive their car to work hurriedly, or to take part in a dangerous construction project. We don’t really know how the business cycle for economic activity is connected to the cycle for elderly deaths. One hypothesis is that economic expansions create air pollution, and air pollution kills elderly people. Another hypothesis is that nursing homes have more trouble retaining their staffs during expansions because they have to compete with other businesses. Perhaps family members who are busy at work during expansions spend less time helping their elderly relatives. Life is valuable, so it may be at least as important to understand what determines mortality and its cycles as it is to understand what causes recessions. Massachusetts and a few neighboring states are likely to experience the Affordable Care Act a lot differently than the rest of America. Massachusetts is often held up as a window into America’s health insurance future, because it embarked on what came to be called the Romneycare reform six years ago. Like the Affordable Care Act provisions going into effect nationwide next year, Romneycare aimed to increase the fraction of the population with health insurance by imposing mandates on employers and employees and by subsidizing health insurance plans for middle-class families without employer plans. Because the subsidized plans are available for only low- and middle-income families whose employers do not offer affordable health benefits, some analysts fear employers around the nation will drop their health benefits as the Affordable Care Act goes into full effect, resulting in millions of people losing the opportunity to get health insurance through an employer. But some people say they believe this fear is likely to be unfounded, because the propensity of Massachusetts employees to receive employer-sponsored health insurance was hardly different after Romneycare went into effect than it was in the years before. The details and dollar amounts in the Massachusetts health care law differ from the national Affordable Care Act, and for that reason alone I hesitate to infer too much from the Massachusetts experience. Even if the two laws were essentially the same, the effects in Massachusetts could be different than the national effects because Massachusetts has a different population and business environment than the rest of the nation. Last week I explained how specific types of employers could be expected to drop their health benefits during the next couple of years: those employers that currently offer benefits but nonetheless pay much of their payroll to people living in households below 300 percent of the federal poverty line, who are eligible for the most generous federal subsidies as soon as their employer ceases to offer benefits. Massachusetts has an extraordinary fraction (almost two-thirds) of its population above 300 percent of the federal poverty line, and as a result practically all Massachusetts employers will prefer to retain their health benefits over the next few years, even though a significant fraction of employers elsewhere will not. One way to quantify the difference between Massachusetts employers and employers elsewhere is in the percentage of payroll going to employees from families below 300 percent of the poverty line. At a national level, the percentage varies from 4 percent in Internet publishing to about 50 percent in restaurants and private household employers. The national average is 20 percent, compared with 13 percent in Massachusetts. Employers have a variety of factors to consider in their benefit offering decisions, but I have made some estimates that focus on the payroll-composition statistics noted above. By my estimates, employers with percentages of 26 to 35 percent of employees above 300 percent of the poverty level have a sufficiently high percentage that they are likely to have been offering health insurance benefits before the Affordable Care Act. Yet they have a low enough percentage that their employees gain on average if the employer health benefit is dropped and employees take the subsidies available through the Affordable Care Act’s health insurance exchanges. About 10 percent of employees with health insurance live in a state and work in an industry with compensation percentages in the range where profits are to be gained by dropping employer health insurance. But none of them live in Massachusetts, and some states that border Massachusetts, including New Hampshire and Connecticut, are in a similar situation. A number of states and industries – especially the industries I emphasized last week – have more than 35 percent of their payroll paid to people in families under 300 percent of the poverty line and are unlikely to be offering employee health benefits. But those employers in Massachusetts who have 35 percent of their payroll paid to people in families under 300 percent of the poverty line are more likely to offer some kind of health benefit, in part because of Romneycare’s incentives to create “cafeteria plans” in which employees authorize pretax salary to be withheld from their paychecks for the payment of health insurance premiums. Under the federal law, the Massachusetts cafeteria plans will lose some of their advantages to employers in terms of avoiding penalties for failure to offer health benefits. Based on the combination of these two factors — that no Massachusetts industries have 26 percent to 35 percent of their employees under 300 percent of the poverty line, and that Massachusetts employers will lose the advantages of their cafeteria plans — I calculate that employers offering health insurance in Massachusetts are one-third as likely to drop their employee health plans over the next couple of years as are employers in the rest of the nation. That’s because the percentage of the United States work force at risk of losing its employer insurance (because of the tendencies of their industry and states to have low- and middle income employees) is three times the percentage of the Massachusetts work force in the same situation. A number of industries can expect big changes in employee health insurance in the next year or two, while others will continue with business as usual. Beginning next year, states and the federal government intend to create opportunities for families to purchase health insurance, separate from their employers, through insurance “exchanges” in the states. Insurers and the federal government will heavily advertise the new plans. Most important, middle- and low-income families may qualify for valuable federal subsidies that will serve to reduce premiums and out-of-pocket health costs. To qualify for subsidized exchange plans, workers cannot be offered affordable insurance by their employers. Paradoxically, employers will create subsidy opportunities for their middle- and low-income employees whenever they fail to offer health insurance. On the other hand, an employer dropping its health insurance next year will put its high-income employees in a tough spot, because they will have to buy insurance on their own without the tax advantages they had in the past by obtaining health insurance through their employer. As a result, employers with relatively many high-income employees will be under pressure to keep their insurance, whereas an employer of middle- and low-income employees may find them asking for health insurance to be dropped from the employee benefit menu. Administrative costs, rising premiums and other costs have already made a number of employers lukewarm about health insurance, but they offered it in order to attract employees who do not care to be uninsured or to end up on Medicaid. The new insurance opportunities that become available next year may give their employees enough of an alternative that the lukewarm employers can drop their plans. Both of these situations are closely correlated across industries, which leaves me to suspect that we can readily predict the industries that will retain employer insurance and predict those that will drop whatever health benefits they currently have. The scatter diagram below displays Bureau of Labor Statistics data on several industries according to the percentage of their employees in families above three times the poverty line (horizontal axis) and the percentage of employers offering health benefits as of March 2012 (vertical axis). I measured employees relative to three times the poverty line because that is the family income threshold beyond which the new exchange subsidies are less valuable than the income tax preference for employer-sponsored health insurance. Industries like colleges, utilities and banking almost always offer health insurance, and about 80 percent of their employees will be getting a better deal on employer health insurance than they would from the exchange plans because their families are above three times the poverty line. For these reasons, I am confident that these industries will continue to offer health insurance to their employees in much the same way that they have in the past. A couple of industries like “accommodation and food services” (i.e., restaurants), leisure and hospitality, administrative and waste services, and construction already have a mix of employers in terms of their health insurance offerings, so it would not be unusual from an industry perspective for those that currently have health plans to drop them during the next couple of years. Moreover, the diagram shows how 45 to 60 percent of their employees do not come from families above three times poverty and therefore will have a significant federal health insurance subsidy waiting for them as soon as their employers drop coverage. Employers that do not offer health insurance may be subject to penalties, but the penalties are not levied based on part-time employees, or levied on small employers, and even the penalties levied will be less than the subsidy opportunities created by an employer of middle- and low-income people that fails to offer health insurance. 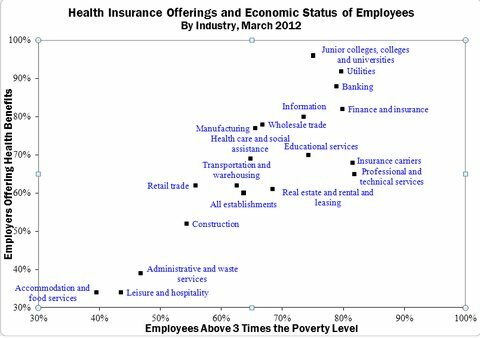 For these reasons, I suspect that the stories we will hear about employers dropping insurance will disproportionately come from the industries shown in the lower left part of the scatter diagram, which collectively employ about 25 million people. Some employers in these industries have already discussed such plans. Do you believe the incentive effects related to the ACA will be more limited since: (i) they are more difficult to value/understand as compared to an unemployment check and (ii) the impact is less direct and comprehensive. You have hit on a key, and so far uncertain, economic force in the ACA. At one extreme, people may perceive the exchanges [the method of ACA subsidy delivery] to be something like Medicaid -- far inferior from the coverage they get from an employer. At the other extreme, they may view the coverage as quite similar, and then it becomes a question of which approach saves them money. Note that U.S. Senators and Congressman will be using the exchange plans, so perhaps they will be pretty nice plans, which is why I am inclined to expect the latter case. But I am examining the former case too because (a) it makes more economic sense for Obamacare to be run that way (see also http://economix.blogs.nytimes.com/2013/05/01/health-coverage-worthy-of-a-senator/) and (b) Massachusetts ran their reform that way. RE difficulty to value and understand, note that employer insurance is complicated, but employers already have HR personnel in place to assist employees in choosing plans, getting enrolled, and getting reimbursed. When employers drop their insurance, I expect that they will use these personnel to assist their employees with the exchanges too. Moreover, the federal government is devoting advertising dollars and enrollment assistance, so that the exchanges may ultimately enjoy a competitive advantage over employer plans. Also note that the ACA’s employer and individual penalties are economic equivalents of unemployment assistance from a labor supply point of view, regardless of how people perceive exchange plans, because workers will be subject to the penalties but unemployed people will not. With that said, I expect a transition period during which time the exchange plans are perceived to be inferior and the labor market impacts of the ACA are muted. Conventional wisdom says that we can make a good guess about the post-2013 labor market impacts of Obamacare just by looking at the post-2006 performance of the Massachusetts labor market as it began its state-level health reform (Romneycare). If there were another country or region that had already tried Obamacare, we would learn a lot from the results. However, even though Obamacare and Romneycare are both forms of “health reform,” and both seek to reduce the number of people without health insurance, they are quite different in terms of the types and amount of labor-market incentives they create. Obamacare is designed to subsidize high quality insurance plans for middle class people -- plans good enough for your U.S. Senator. Romneycare only subsidized Medicaid Managed Plans with benefits of far less value than the typical employer health plan. Under Obamacare, middle-class families can get subsidized health insurance for their entire family, including their children. As noted above, those plans are good enough for their Senator. Under Romneycare, the new subsidized plans were for adults only; families wanting subsidized insurance for their children had to apply for Medicaid. For the first time under Obamacare (with a brief exception under the American Recovery and Reinvestment Act), most workers outside of Massachusetts will obtain health insurance subsidies only by leaving their job or getting fired -- the economic equivalent of unemployment assistance. Romneycare did not introduce health insurance subsidies for the unemployed in Massachusetts, because the state has had such subsidies in place since the 1980s. Under Obamacare, middle-class persons leaving a job with health insurance are immediately eligible for subsidized health insurance. Under Romneycare, there is a six month waiting period, and even then only if the persons do not qualify for Medicaid. Both Obamacare and Romneycare have per-employee penalties for employers not offering insurance but, accounting for the business tax treatment of those penalties, the Obamacare penalties are more than ten times larger. Romneycare was designed to leverage the special federal tax treatment of employer-provided fringe benefits. Obamacare is designed to reduce the usage of that special federal tax treatment. Romneycare subsidies exclude families between 300% and 400% of the federal poverty line. Obamacare subsidies do not. Even if the two reforms had the same income cutoff, a larger fraction of Massachusetts would be above it because Massachusetts is a high income state. Employer-provided insurance was a lot more prevalent in Massachusetts before Romneycare than it is in the U.S. generally. ie., even if we ignore the penalty amounts and subsidy values, the fraction of the U.S. labor market directly experiencing the Obamacare penalties and subsidies will far exceed the fraction of the Massachusetts population experiencing Romneycare penalties and subsidies. The combined difference between Romneycare and Obamacare is greater than the sum of the individual differences noted above, for the simple reason that the total incentive created by new programs is the product of takeup, eligibility, and the value of subsidies to each participant. As a result of these differences, Obamacare does a lot more to encourage employers to drop insurance. Under Romneycare, dropping employer coverage amounts to telling employees "It's time for your children to go on Medicaid, and for you to go on a Medicaid Managed Plan, and you probably won't use your family doctor anymore." Under Obamacare, employees will be told "You can join the same health plan as your Senator AND save money." Obamacare creates a massive new implicit tax on work. Romneycare probably created a new implicit tax, but, for the reasons noted above, the Obamacare implicit tax will be one or two orders of magnitude greater. To learn more about Romneycare, take a look at the book The Great Experiment. Work-sharing proponents have credited Germany’s comparatively low unemployment rate to its adoption of a work-sharing program, because the program encourages German employers to reduce employee hours rather than lay workers off. Work-sharing proponents may be right, although Germany carried out a number of labor-market reforms at the same time, such as allowing businesses to use temporary workers more easily. The IMF had a recent conference on rethinking macroeconomics. I was not invited and did not attend, but watched the video. Conspicuously absent from the fiscal policy presentations is any acknowledgement that transfer spending in practice reduces the reward to work and as a result is "destabilizing." Nobody raises this issue, let alone explain why marginal tax rates and related incentives should be ignored. It is just common knowledge in this part of the macro community that marginal tax rates are so far down on the list of factors to be considered that they are not even worth one tenth of one percent of the presentation time. The closest any presenter gets to this issue is that Professor Perotti takes 5 seconds to note that ALL of the econometric evidence on "government spending multipliers" are really estimates of government purchase multipliers and tell us nothing about the effect of transfers on GDP (see page 15 of the pdf containing his slides). Professor Roubini mentions "moral hazard" (approx the 60 minute mark of the video), but he is referring to incentives for government behavior, not inventives faced by households and nonfinancial businesses. Professor Gordon talks about determinants of hours per capita (75 min mark), but fails to mention marginal tax rates or anything like a substitution effect! In his reply to Gordon, Professor Roubini takes 20 seconds to mention that "In France ... unemployment benefits are ridiculously high" (79:25), leaving open (but unsaid) that high unemployment benefits in other countries may be a factor. To promote economic efficiency and the goal of universal health coverage, perhaps members of Congress should not be required to enroll in the new insurance exchanges. The Affordable Care Act of 2010 seeks to invigorate the nongroup health insurance market – that is, health insurance that people can buy without going through an employer – by creating and subsidizing insurance exchanges similar to the one created by Massachusetts in 2007. In addition, the law seeks to make health insurance affordable for middle-class families by having the federal government pay part of premiums and out-of-pocket costs, but only for people buying nongroup health insurance through the new exchanges. A provision of the law known as the Grassley amendment requires members of Congress and their staffs to obtain their own health insurance through the exchanges. The amendment gives the authors of the law, and the authors of future tweaks of the law, a personal stake in the success of the plans to be provided through the new exchanges. But the possibility that middle-class families could obtain care that is both top quality – good enough for your senator – and subsidized creates a number of economic problems. It gives employers a stronger incentive to drop their coverage, because employers and their employees can take comfort in the prospect that the alternative to employer insurance is a health plan that is good enough for your senator. If the exchange plans were good enough, people who are rushing to find a job, and people considering leaving their job, would no longer have to see employment as their only means of obtaining top quality, subsidized coverage. As a result, some of those would work less (see the Congressional Budget Office on some of health reform’s work incentives, and a 1994 explanation from Alan Krueger and Uwe E. Reinhardt). The more attractive the subsidized plans are, the more people will join them, and the greater the costs to the federal government. If the Affordable Care Act proves to be too expensive, drastic steps may result, such as closing enrollment in the subsidized exchange plans or repeal of the law all together. Either result would mean that the law’s objectives would go unmet. There is an alternative approach, pursued in Massachusetts, for those not covered through an employer, a spouse’s employer, or Medicaid or Medicare. They may be eligible to join one of several subsidized plans under the state’s Commonwealth Care program (most are operated by the Medicaid managed care organizations), but those are less desirable than the plans typically offered by employers. With that as the alternative for their middle-class employees, employers would be discouraged from dropping coverage. People would have an incentive to work, because that’s where the best plans would be available. Massachusetts did not have anything like the Grassley amendment. For these reasons, economists have long recommended that subsidized goods be of somewhat lower quality than goods available without subsidy. Massachusetts followed that advice, and found that (a) their health reform approach significantly reduced the number of uninsured and that (b) less than 10 percent of the people in Massachusetts whose family income fell in the subsidy-eligible range chose to participate in the subsidized plans. Although politically incorrect and perhaps unfair, allowing members of Congress to keep their federal employee coverage might be the best thing for universal coverage and reducing the impact of the Affordable Care Act on the federal budget.